When prospective clients ask how to build the most house for their budget, my response always emphasizes efficiency: the most efficient “container” minimizes the number of “sticks” (material) relative to the square footage of enclosed apace. After all every stick requires framing labor, siding, insulation, sheetrock, and trim to install and finish. Simply put, a design that makes efficient use of material will make efficient use of your budget from start to finish. Keep the roof simple. Minimize complexity: few dormers, clerestories, valleys or intersecting rooflines. Keep the overall foundation simple. Can we do it with only four corners in the foundation and the building that it supports. Use windows wisely. Windows are among the most expensive (and important) components of any home. The proper placement of windows will ensure a naturally lit home and plenty of natural ventilation. Group the windows to create larger expanses of glass and to extend the sense of space at the end of hallways. I believe that what “makes a window is a wall.” The contrast between transparent and opaque can be exciting. Most Lindals have twice the glass area of conventional homes. Let’s use it wisely. If the topography allows, build into a sloping grade and use the foundation walls to increase living space. In a Lindal these spaces are typically over 9 feet high and contain enough glass to ensure plenty of natural daylight. The ideal slope is 6 to 9 feet from the front of the house to the rear. Sounds boring? Let me show you otherwise. A fabulous couple described their vision to me, and it added up to roughly 2500 square feet of living area. The level of investment that was comfortable for them would require that we maximize efficiency, select Lindal options wisely, and shop a bit for finishes such as flooring, cabinets, countertops and appliances. They expressed concern that their Lindal would pale in comparison to many they’d admired in the company's planbooks.. I assured them that if they accepted my guidance we’d create an efficient and exciting home that would respect their budget… and we did. The agrarian roots of the region made the simple and strong barn form a logical choice. The site which slopes down to the east with a wooded and distant lake view would bath the main level communal spaces in warm morning sunlight (the clients are early birds), along with the daylight lower level, provided we do not share the window wall with a main level deck. Step 2: Build excitement and spaces of varied scale inside the simply efficient barn form. Like a barn loft, private master suite enjoys views in all directions as well as down to the great room below.. Perched above the kitchen and dining room, it provides comfortable scale to those functions. Stepping out from under the master suite, the great room living area extends two storeys to the pitched roof that will be lined with warmly prefinished tongue and groove cedar, complementing the cedar door, window, and baseboard trim. A private zone on the lowest level for visiting college aged children and weekend guests is served by its own communal area, which may also be used for staging her work projects. A total of 2100 square feet of living area in a simple form controls the cost, while a wide variety of interior spaces inside that form, different in scale and privacy, add excitement and a richness to everyday life. The clients’' selection of Lindal options, the willingness to provide a little sweat equity (interior painting and staining), allows for the addition of a simple dormer. While the main barn form will be clad in pre-stained beveled horizontal cedar siding, the dormer will be clad with corrugated steel with a twenty five year finish. The exterior overhangs and interior surface of the roof will be finished with beautifully warm tongue and groove cedar liner, delivered pre-finished by Lindal for efficient installation. Warm cedar will trim window and door openings. The simple dormer adds a spacious dressing area to the master suite and a private home office for his daily work that overlooks the great room and the wooded exterior. Below that, a covered entry porch and roomy entry, a laundry room and pantry area, and a private one-person reading nook off the great room for her professional and personal reading will capture late afternoon sun. Finally, we add a150 square foot covered deck on the north end of the great room that offers great view and morning and late afternoon sun without blocking the sun or view from any living space. 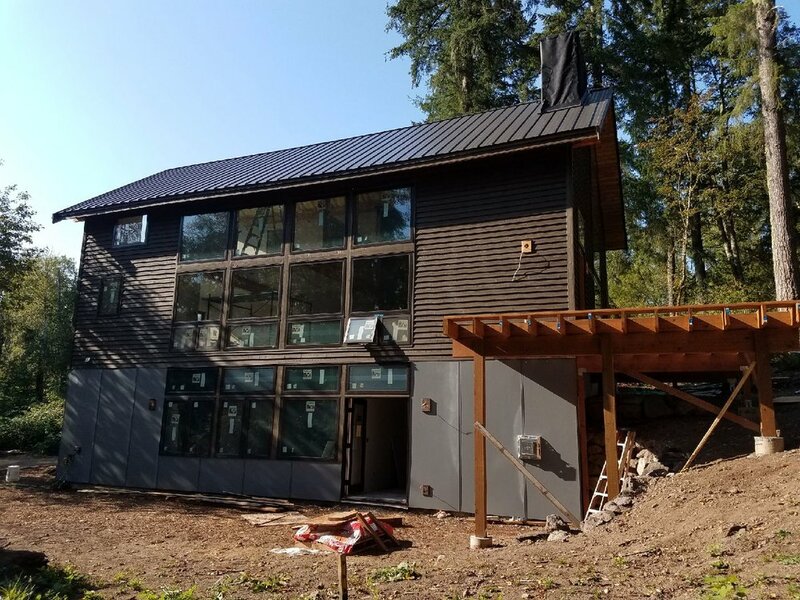 The end result: a 2500 square foot house crafted of beautiful Lindal material and built at a cost competitive with far less interesting conventionally built homes. ﻿The image sequence below shows how the efficient yet exciting home is taking shape.